If you’re planning to study abroad at a U.S. university but have not yet decided which one, Bridge Pathways has the perfect solution for you. Start your studies at our BridgePathways Denver City Center! Enroll in the Academic English Program at our centrally located campus in downtown Denver and you can prepare for university success while adjusting to American life. Why Study English at BridgePathways in Denver, Colorado? At BridgePathways in Denver, you will take exactly the same Academic English Program that you would on-campus at our partner universities. Just like the programs on our BridgePathways partner campuses, the standardized Academic English curriculum at our Denver City Center is designed specifically to help you succeed in future university studies. The program requires practical tasks like participating in debates, conducting research, giving presentations, writing essays and listening to lectures. You’ll also strengthen your critical thinking and analysis skills and develop good study habits in preparation for university. Bridge staff offers free, one-on-one, expert advising to help you choose the university that is best for you. Choosing a university is an important decision and you may not be sure which school or program is the best fit for you. At BridgePathways in Denver, our advisors are here to offer their professional expertise and guide you toward a university that suits your academic goals, extracurricular interests, location preferences and budget. We also organize university information sessions and help with the application process. College applications can be complicated for any prospective student, but they can be even more challenging for international students. Once you’ve narrowed down you’re your university choices, Bridge staff takes the anxiety out of applying by personally assisting you in completing your university applications, from start to finish. 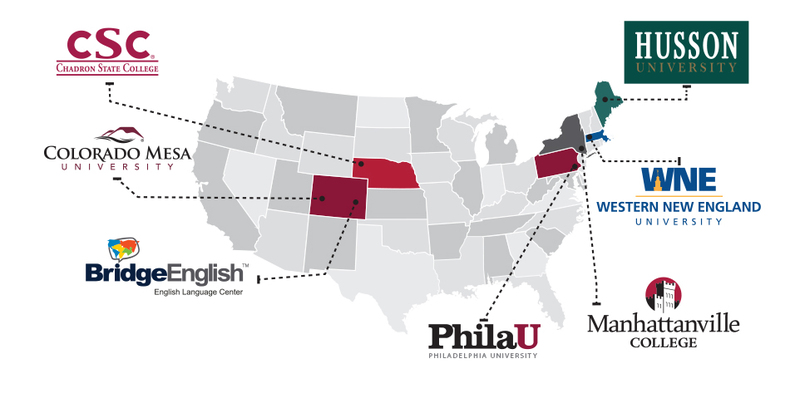 We have 17+ TOEFL waiver partnerships across the U.S. When you enroll at BridgePathways Denver, applying to any of our conditional admission university partners is easy. In fact, if you meet all of the admission requirements for the university of your choice, except for the required English proficiency level, you will be granted conditional admission and possibly a TOEFL (Test of English as a Foreign Language) waiver! We offer home-stays in Denver for extra support. Before you move on campus at your chosen university, make your transition into the U.S. smoother by choosing our home-stay option while you study at BridgePathways Denver. It’s a great chance to practice your English in a friendly, welcoming environment, and also gives you time to adjust to American culture. If you are sure you want to study abroad at a U.S. university but you’re not yet sure which one, BridgePathways Denver City Center is a great choice. Enroll in the Academic English Program with Bridge and you can improve your English, adjust to American culture, and get personalized advising and support, making your transition into a U.S. university seamless and fun! esl-blog, Uncategorized academic English, Academic English Program, BridgePathways, denver colorado, learn English, Pathways Program, Study English, study English in the US. permalink.